North Korea's state-run media claimed that the country has developed the ability to load a hydrogen bomb onto a new intercontinental ballistic missile, although some outside experts already cast doubts on the claim. 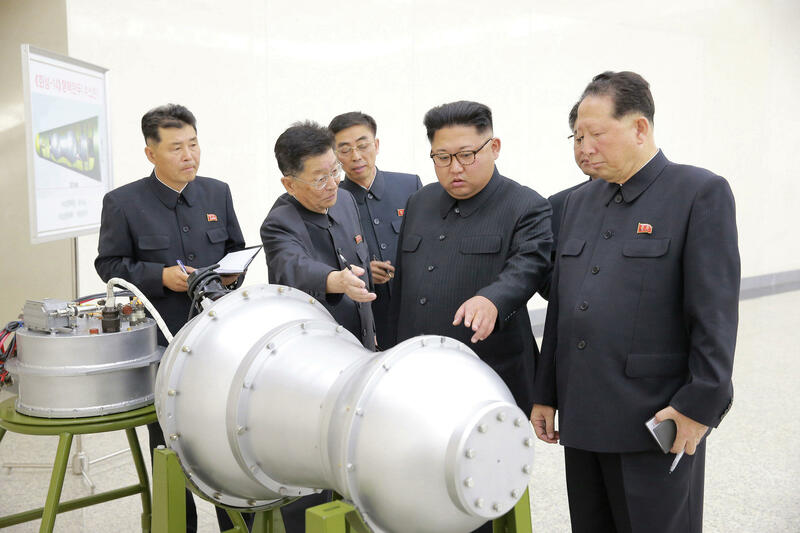 According to Pyongyang's state media Korean Central News Agency, Kim Jong Un inspected the loading of a "homemade" hydrogen bomb onto the ICBM at North's Nuclear Weapons Institute. The explosive power of the bomb is adjustable from tens kiloton to hundreds kiloton," the state run KCNA said. A U.S. intelligence official told CBS News that the U.S. is aware that North Korea is "working on more advanced nuclear weapons," and North Korea claimed the Jan. 2016 test was of a hydrogen bomb. "If it was such a test, it clearly was not a success," the official said. "We wouldn't be surprised if the next nuclear test -- whenever it occurs -- is again an advanced nuclear weapon design." But the Institute for Science and International Security, a U.S. non-profit dedicated to providing public knowledge of nuclear proliferation and international security, tweeted that North Korea can "build any H bomb (two stage) model it wants and call it whatever it wants but that does not make it real." The non-profit also said "it looked like a model in a room for models." 1. NK can build any H bomb (two stage) model it wants and call it whatever it wants but that does not make it real. 2. Looks like a model in a room for models, not for loading nuclear devices into re-entry vehicles. 3. These pictures show that NK wants us to think it is working on thermonuclear weapons. North Korea in July conducted its first ever ICBM tests, part of a stunning jump in progress for the country's nuclear and missile program since Kim rose to power following his father's death in late 2011. The North conducted two nuclear tests last year alone. The first involved what it claims to have been a hydrogen bomb and the second was its most powerful ever. Experts and outside governments are skeptical of the hydrogen claim, but it is almost impossible to independently confirm North Korean statements about its highly secret weapons program. The key question is how far North Korea has gotten in efforts to consistently shrink down nuclear warheads so they can fit on long-range missiles. South Korea's main spy agency has previously asserted that it does not think Pyongyang currently has the ability to develop miniaturized nuclear weapons that can be mounted on ballistic missiles. Some experts think the North may have mastered this technology. North Korea is thought to have a handful of rudimentary nuclear bombs and has spent decades trying to perfect a multistage, long-range missile to eventually carry smaller versions of those bombs.